I dreamt of you last night. I had to sleep with all the lights on. What you are capable of — I didn’t know that anyone could wield so much power. Certainly no one could and remain kind. The power corrupted you, dear. You went too far, and the power consumed you until I hardly recognized you. You — my own sister. The power made you forget yourself. It made you forget me. So I tried to forget you. I decided to leave the family, lest I become like you. I remember leaving you there on the wooden bridge. The one that let you see the whole earth: the soaring trees, tinted orange in the light; the proud, sloping mountains; and the river far below, glowing the color of a robin’s egg. I loved that view. You were angry that day. So enraged that it scared me. I knew you would not take my news well. I was right. When I told you that I was leaving the family, you screamed at me. Maybe it was my imagination, but I saw a faint red aura flare up around you. More magenta than red, really. Like there was some smidgen of kindness left in you, and it kept the aura from being pure, undiluted evil. I sprinted away, pulling my feet high so I wouldn’t trip on one of the wooden boards. If I did, and if I fell over the simple platform of the bridge, it would be a very long way down. You didn’t stop me, and I reached the nearest town. It was a desolate wasteland. The once-graceful buildings had crumbled to dust. The overgrown stalks of grass wilted. I was the only breathing thing in that place. And it was all because of you. Bitterly, I thought to myself, Are you proud of your handiwork, sister? I traveled on to the next town. That one, thankfully, was inhabited. In this place, people scurried across the streets like rats, their heads bowed, making no eye contact. Stores were left unguarded, and many starving people darted into abandoned grocery stores and stole food. They were doing their best to stay alive. Now that I had escaped your heavy presence, I wasn’t sure what to do. I’d always spent my days hiding from your wrath. But now . . .? I trudged down the town’s main road, looking for somewhere safe to rest. That was when I saw the girl. She was sitting cross legged in the grass with a thin gray cat in her lap. The girl’s pure black hair was tied into a loose braid. Her shocking periwinkle eyes stood out from her porcelain skin. She looked less threatening than some of the other shady characters I’d seen roaming the streets, so I crossed the road and sat down next to her. I swallowed hard. “Yeah.” My fingers dug into the dirt, and I snapped the stem of a flower. It was delicate violet. Shyly, I handed it to her. Trinity smiled softly and tucked the purple flower into her braid. That was the day I met my best friend. I stayed in that town for years, undiscovered by you. Trinity stayed, too. Eventually, when we were much older, we got married. I liked to think that you would have approved of her. Trinity and I had been married happily for years when you sent the postcard. It was waiting there on the porch, not in the mailbox where all other correspondence went. Just like you, I thought when I saw your name signed at the bottom, to fight against normal things. On the front of the postcard was the view from our bridge. Even though I hadn’t seen it in years, every detail was burned into my mind. I flipped over the postcard. 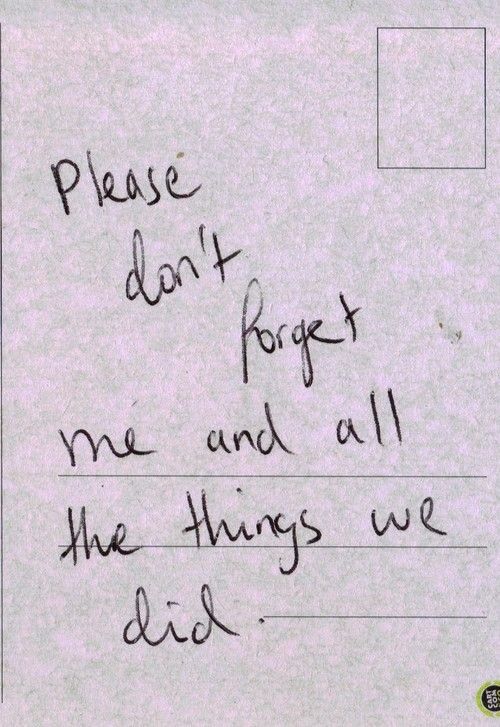 Written in black pen, in your familiar handwriting, was one sentence: Please don’t forget me and all the things we did. My eyes misted over. I’d never truly forgotten you, sister, even though I’d tried. You’d simply . . . faded. The peaceful you that hugged me daily and sang to wounded animals in the forest — that faded. But faded things can be restored. A smudged drawing can be brought back to its former glory by running a pencil over the already existing lines. And as I gazed at the postcard, I thought that maybe I could restore you. “Nothing,” I murmured, folding the paper quickly. “I just need to go on a quick trip. It’s important.” I kissed my wife on the cheek as I rushed into the house, eager to pack a bag and get going. Because I was going to find you. My older sister. You do give me nightmares. But I still love you. I believe that there might still be some good in you after all. I hitched a ride on a bus and got off at that first desolate town I found after I left you. Things were finally starting to grow there again. I didn’t linger, because the lonely place brought back all the fear and heartache I experienced after I ran away. Eventually, I reached our bridge. I choked up when I saw that the wooden slats were decaying. I had grown up here, and to see it falling apart . . . With carefully placed steps, I made it safely to the other side. I descended the cracked stone steps that led down to the robin’s egg blue river. “Thea?” I called. “Thea, it’s me. I’m here . . .” I wandered along the riverbank, heading for our old home. The cold, damp mist rolling off the water cooled the sweat on my forehead. It transported me back in time, to the time before the power ruined you. I was jolted from my bittersweet memories when I tripped over a thick mossy root and tumbled into the river. The cold water was a shock against my skin. Spluttering, I scrambled back onto the bank and hugged myself, shivering. “Are you alright?” asked a a stern feminine voice. I glanced around for the owner of the voice. 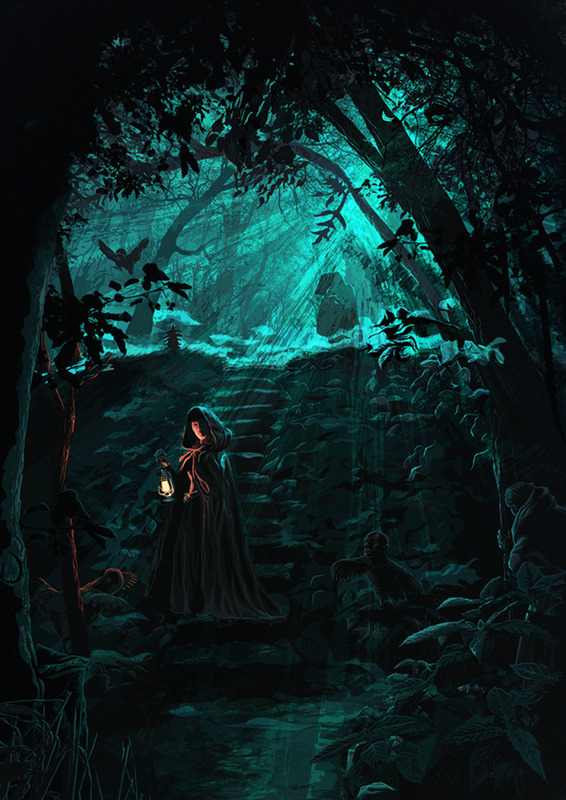 A tall woman, dressed in a dark green cloak, stood upstream. The hem of her cloak brushed the ground, and a hood concealed her face. All you could see of her was a long, pale hand holding aloft a lantern, and red hair spilling out from under the hood. I had never seen her before in my life, even though I’d roamed the woods until I was thirteen. She must have become “protector of the forest” after I left. I cleared my throat. “I’m Owen. Please let me pass.” Cyra was blocking a flight of limestone stairs that led to our old home. The darkness in her voice made my heart twist with dread. Cyra swept past me and ascended the stairs silently. My anxiety about seeing you grew with every step. As it turns out, I had nothing to fear. Cyra led me past our old home. In the middle of a clearing beyond our home was a giant white crystal, probably quartz. Dark blue words were engraved in the crystal. Cyra slipped off her hood and bowed her head respectfully at the stone. “Where is she?” I breathed, even though I already knew. An elaborate, swirling eagle was scraped into the quartz below those words. There was a third line, but my eyes were almost too blurred with tears to make it out. I crumpled onto the ground and pressed my forehead against the smooth crystal. “Your sister missed you dearly,” Cyra said softly after a minute or two. “I arrived to protect this forest a week after you left, according to Thea. She hardly left that bridge. Said she was waiting for you to come home. She hardly spoke, Owen, and I was deeply concerned for her. The winter months would come, and she would sit on the bridge through the snow and frost. She got horribly sick the Christmas after you left. She never made a full recovery. Cyra continued, “I suppose the strain of traveling was too much for Thea. She . . . well . . . she passed away shortly after her return.” She faced the beautiful crystal gravestone. “I am sorry. She was a good friend to me.” Cyra left quietly. I leaned back and read the stone’s inscription once more. With Cyra gone, I allowed myself to cry for you. I was only with you for a few years. I wished desperately that I could reach back through the years and tell my younger self not to leave you. I was ashamed that I had let you fade. I would have given anything to have just a minute more in your presence. I’m really crying hard right now Loren.This has really touched me.